The Arch of Trajan has been for centuries a reference point for sailors. 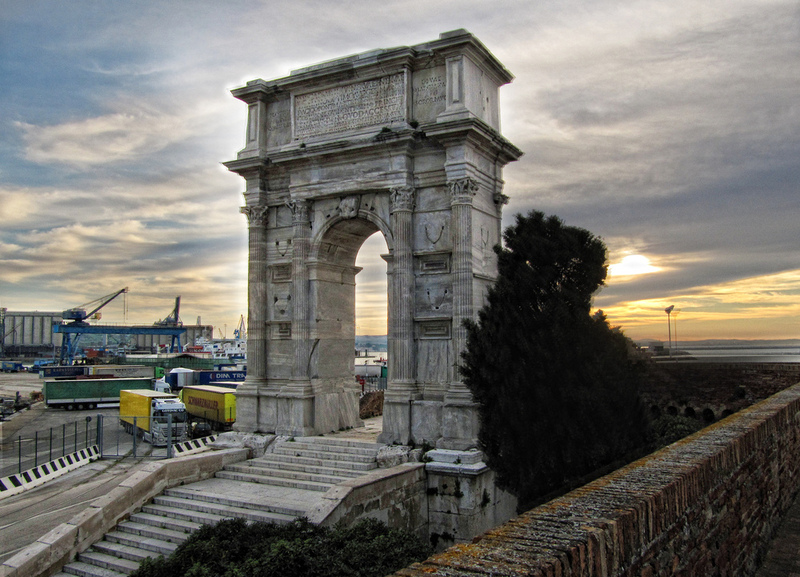 Today it dominates the harbour entrance and it is a shining testimony of the thousand-year history of Ancona. 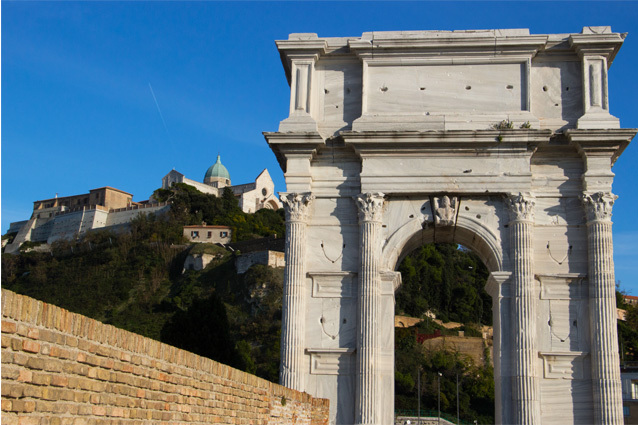 The Arch of Trajan is an elegant Roman work erected in 116 AD in honour of the emperor who enlarged the port of Ancona at his own expenses and who built the pier for the protection of the city. This work is attributed to Apollodorus of Damascus, the same architect who signed the project of the glorious Forum of Trajan in Rome. It is from this place that Trajan left for the victorious war against the Dacians: the Arch, located at the access point of the city, reminds of the defeat of the enemies. Tradition says that on the Attic there was the equestrian statue of Trajan with on the right the statue of the wife Plotina and on the left the statue of her sister Marciana. The holes and cavities that appear between the columns needed to secure the bronze beaks of ships disappeared in the events of the centuries. Even in the past the magnificence of the monument was appreciated and in the ‘700 each captain of the vessel that landed in Ancona was asked to pay 60 Baiocchi for its preservation. Just up ahead, where the medieval city wall ends, stands the Clementine Arch, made of Istrian stone and built by Luigi Vanvitelli in honour of Pope Clement XII (1738). O the summer of 2015, finally, after years of “battles”, the networks separating the city’s harbour from the sea were taken off. Come here for a walk during the sunset to admire on one side the Arch of Trajan framing the Cathedral of San Ciriaco, and on the other, to enjoy the sun setting over the sea colouring the sky of red.